There are a total of seventy-seven (77) tennis balls available as scoring objects in Bridge Battle. Sixty-one (61) of these tennis balls will be found on the field, while eight (8) will be available to each alliance prior to the match. Three (3) of the sixty-one tennis balls on the field are bonus balls. Each robot (no larger than 18″x18″x18″ to start) begins a match touching one of the colored alliance station tiles for their alliance. There are two rectangular bin shaped goals designated for each alliance, at a height of 14.5″ off the ground. These four goals effectively divide the field into two halves, with less than 12″ of clearance for robots to pass underneath. 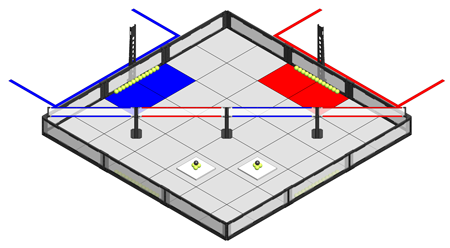 Alliances can earn additional points at the conclusion of a match by having one or two of their robots “parked” on either of the 3/4″ high, 15″ square scoring platforms located on the far side of the field. Excellence Award 83 Chaminade College Preparatory Middle School California, U.S.